Back in May, 2018, we started our search for a Director of Sales. In August, 2018 we hadn’t hired anyone and shared about the process on the podcast. Now- great news! We have a Director of Sales! 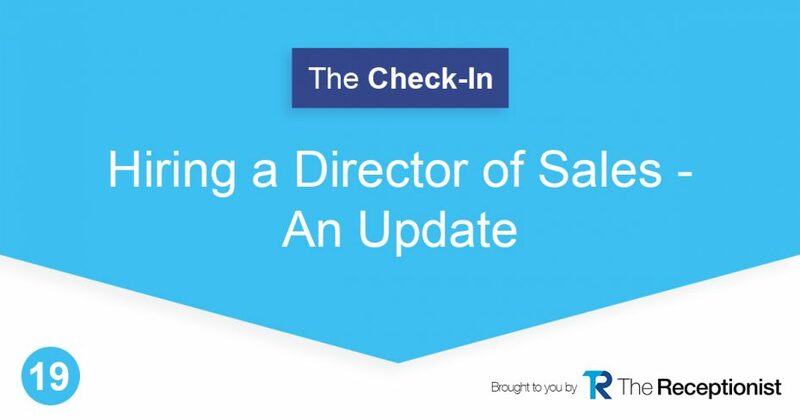 When we recorded this episode in January, 2019 with Andy Alsop, CEO of The Receptionist, our new Director of Sales, Tom Foster, was on day 2 in his new role. We’re thrilled he’s with us! We have a very thorough hiring process that begins with Scalability Solutions finding candidates that would be a good fit based on our conversations with them. After a phone interview with Andy, they then go through a lengthy simulation experience, and then group interviews. At different points in the process, but often in the simulation (where candidates role play and show us how they’d handle different scenarios), we’d often learn that the candidate wasn’t the perfect fit. It was tempting to hire someone who was a decent fit, but we held out, and we are so glad we did. As a cash-flow positive company, we didn’t feel rushed; we remained patient, and now we have Tom Foster, who everyone is thrilled with. What stood out about Tom? A lot of things, but one that we kept coming back to was his level of preparation for the interview and hiring process. Once he gets settled, he’ll be able to help us grow, focusing more on finding the companies that we want to connect with and becoming masters of our own destiny when it comes to growing The Receptionist. Andy has said it before: hire slow and fire fast. This is a prime example of hiring slow and it being worth the wait. Even if your company has a vacancy, resist the urge to fill it with someone who is good enough. You’ll likely end up wasting time, and possibly removing that person from the position. Take your time from the start when it comes to hiring; you’re busy so consider using a company like Scalability Solutions to help vet potential candidates, and adjust your hiring process if needed- though time-consuming, we learned it makes sense to do simulation experiences before our team interviews. We’re so glad that this hiring finally has the happy ending we’ve been looking forward to and now we’ve got Tom Foster, Director of Sales, who will helps us develop and implement strategy to work toward our goals.